I know you’ll love your weighted blanket as much as I do, and I bet you think that just using it can’t get any better. But it can. I’ve always believed that the measures you take externally to better your health and wellness must be complemented internally, hence this article. I’ve said this before, but I’ll say it again, we all love a good night’s sleep, but rarely seem to get enough of it for some or other reason. 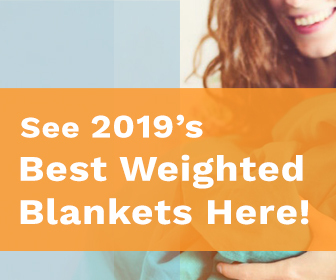 Then the weighted blanket was invented, bringing a wealth of health benefits starting from the always welcome improved sleep, but I wanted to give you a little more advice that you can use to help the whole family. I’m going to show you some supplements and home remedies to improve relaxation and sleep even further. There are plenty of conditions that may keep you up at night, from insomnia, poor blood circulation, cold hands and feet, anxiety and stress to too much caffeine or other stimulants to name a few. Thankfully there are ways to combat these conditions through the use of sleep aids, natural therapies and all sorts of sleep medications. Even though there are tons of over the counter meds you can use to help you sleep better, I am here to keep things natural and discuss more organic options because I believe that nature can provide a huge portion of what we need to be healthy. Here are a few of my favorite things to help you unwind at the end of the day and achieve optimal rest. The best thing about these supplements is that they are natural, non-habit forming and don’t have any nasty side effects. You can use these before you get under your heavy blanket for the best results. When you walk into your bedroom you should instantly want to take a nap. The best thing you can do for yourself is to arrange your bedroom in such a way that there is nothing that can disturb you from getting a good night’s sleep. Have your bed sleep-ready by making it neat every day, have your weighted blanket handy and remove all electronic devices that have bright lights and notification sounds that can stimulate neurons in your brain which ultimately disrupt your sleep. You’ve probably heard this name a few times but aren’t really sure what it is. Melatonin is probably my most favorite sleep supplement because it is a hormone that the body creates naturally by the pineal gland. This gland is in your brain and is responsible for your body to distinguish between its wake and sleep cycles. But as we age and get stressed, there seems to be a lack of it in our systems. Therefore, supplementing with melatonin each night is a great non-medicinal, non-habit-forming way to get the rest you deserve while staying comfy under your weighted blanket. Or 5-Hydroxytryptophan is an amino acid that is the predecessor for serotonin, the ‘happy-hormone’. The production of 5-HTP is vital to help relax the body, improve mood, and aid in proper sleep. This is a neurotransmitter that inhibits the excitability of the nervous system. In other words, it helps calm your nerves and control the risk of overstimulation. Thus, supplementing with it will also help you sleep better and longer. These two nutrients are directly linked to your sleep cycle and are important for you to reach your REM sleep phase. A lack thereof can cause insomnia and muscle tension that can keep you up at night. So, dose up on these two nutrients and as a bonus or boost, add some potassium to your diet as well. This amino acid is found in herbal teas like green tea, oolong tea and even black tea (but do remember they contain caffeine too so find a happy balance and don’t drink too much.) L-theanine helps increase the ‘sleep brain waves’ or alpha wave activity. Thus, also stimulating the production of more serotonin, dopamine and GABA that will certainly help you sleep better and improve your mood. This plant has very high relaxation and anti-anxiety effects without the after effects that cause grogginess and lack of focus during the day. This root contains sedative properties that will definitely have you snoozing away under your heavy blanket in no time. When you consume it, it subtly increases the GABA levels I talked about before. I usually take it as either tea or pills 30 minutes before going to bed whenever I feel that I really need to sleep well. It works wonders, but I often can’t get up the next morning. This vitamin is exceptionally important when maintaining niacin and serotonin levels in the body. These neurotransmitters help maintain and regulate proper sleep patterns. A lack of Vitamin B-6 can clearly cause insomnia and sleeplessness. Working up a bit of a sweat a couple hours before bed is never a bad thing. It gets the system up and running, and helps blood flow to your extremities rather than your brain, which will help you sleep a lot better. Now don’t get me wrong, I am not saying you should use all of these supplements together to get a good night’s rest, that would be a bit too much. I like to utilize a process of elimination when it comes to this by experimenting with various combinations to find what works for me, and you should do the same. After all, what do you and your weighted blanket have to lose but a bit more daylight? If you think using a weighted blanket will decrease your blood circulation, think again! It’s actually a great way to diminish swelling in the joints through pressure point stimulation, that would cause poor blood circulation to begin with. Combining the use of your heavy blanket with some of the below natural remedies, will not only improve vital blood circulation, but also surge lymphatic flow and detoxification of the body through the skin. So, here’s a list that will surely help you win the fight against bad circulation. This is most certainly my favorite way to increase blood circulation. By vigorously sweeping a dry cactus bristle brush over dry skin, you’ll remove dead skin cells, increase the microcirculation of superficial blood flow through shallow blood vessels that can get stagnant very easily, and stimulate lymphatic drainage. This increase in blood from will help nourish skin making it look youthful, radiant and glowing. If you don’t already know this, listen closely, cayenne pepper is probably the most underrated natural spice in the world, but its benefits are unbelievable. I won’t get into too many of them today, I’ll focus on its blood circulatory functionality. The main ingredient in cayenne pepper is capsaicin, it’s a natural anticoagulant (blood thinner) or anti-blood clotting agent that helps prevent lipid deposits from blocking blood flow through veins and arteries, allowing blood to move evenly and uninterrupted. It’s also a vasodilator, that opens up these arteries and veins clearing away any clots. Much like cayenne pepper, Curcumin, found in turmeric, also prevents blood clotting and atherosclerosis or plaque buildup in the arteries. Combining a teaspoon of cayenne pepper and turmeric with a cup full of milk, bring to the boil, add a teaspoon or two of honey per your taste and taken daily, will do your circulatory system a world of good. Now I know that made you smile. If like me you love chocolate, then you’re a happy camper right now. Dark chocolate, or rather the cocoa found in it, helps increase blood flow, especially in the legs by encouraging biochemicals that expand blood vessels. It is also full of antioxidants that fight against free radical damage among other great benefits. Make sure however that you consume cacao, the less processed and more organic version of the cacao bean. These are much higher in nutrient and antioxidant content and have much greater health benefits. I’ve talked a lot about getting great sleep in this article, but let’s look at plain relaxation, calming your nerves and decreasing stress in the body that can cause so many other illnesses. Along with your weighted blanket and much like the remedies you can use to combat sleeplessness, can be used to combat stress too. But just had to add a few bonus points that will greatly improve your overall wellbeing and state of mind. There are tons of great options you could use when it comes to herbal teas for relaxation such as chamomile, catnip, lemon balm, linden, passionflower and peppermint tea to name a few. Choose which flavor you prefer and enjoy a cup before popping underneath your heavy blanket for some well-deserved rest. Again, you are spoilt for choice with some great options here. The best are; geranium, lavender, rose, ylang-ylang, bergamot, sandalwood, cedarwood, vetiver and roman chamomile essential oils. It’s important not to go overboard with these as too much can be slightly stimulating. Put one or two drops of your favorite oil in your bath or on your pillow and let the essence help you drift into sleepy bliss. Vitamin A, B complex, C and D are excellent vitamins to fight stress. The combination of these vitamins not only support a healthy immune system, cellular regeneration and have antifungal, antibacterial and anti-inflammatory benefits, but they also help the body fight free radical damage and the production of the stress hormone cortisol. Ok, I can go on and on about the wonderful supplements you can use to truly complement your health and the use of your weighted blanket, but I’ll leave it here for now. Enjoy experimenting with some of these remedies, and experience the great benefits they and your heavy blanket will provide your overall wellbeing.